This Sunday, on Pascha, CBS is airing a program on the Orthodox monasteries and monks of Mt. Athos! Don’t miss this important program! NEW YORK, NY [GOARCH] — The Holy Mountain Athos, which for over 1000 years has been a sanctuary of Orthodox Christian monasticism, and which is directly under the spiritual jurisdiction of His All Holiness, Ecumenical Patriarch Bartholomew, will be featured on the CBS News program “60 Minutes”, scheduled to air on Pascha Sunday. The segment, “The Monks of Mount Athos,” will recount 60 Minutes Correspondent Bob Simon’s journey to a remote peninsula in North Greece that millions of Orthodox Christians consider the most sacred place on earth, Mount Athos. On the recommendation and with the blessing of Ecumenical Patriarch Bartholomew, doors were opened for the 60 Minutes team. After two trips to the mountain and two years of dialogue with the Anthonite community, Simon and the 60 Minutes team were given unprecedented access to document monastic life on the Holy Mountain. The result is a portrait of a place rarely seen, where prayer has been offered by holy men everyday, with no interruption, for more than a thousand years. The “Monks of Mount Athos” will be broadcast Sunday, April 24, 2011 on the CBS Television Network at 7:00 PM EST. Harry Radliffe and Michael Karzis are the producers of the segment. 60 Minutes is the pre-eminent investigative television news show in the United States and has run on CBS since 1968. It has been among the top-rated TV programs for much of its life and has garnered numerous awards over the years. 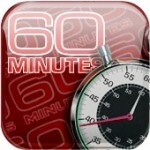 The show will also be broadcast over the Internet at www.60minutes.com.